They say retrospect is gold. In keeping with this, even the temporal displacement of one week is enough to promote subtle alterations in one’s perspective. I stand in the wake of last week’s turbulence with new thoughts and questions. Many of these new questions are rhetorical in nature. Principally, I have been left pondering at the hierarchical structure of the University. Is the power dynamic really so skewed that the progressive efforts of thousands can be completely undermined by the quick decision of so few? Moreover, can the repercussions of such a decision be so easily concealed by the resolution of undergraduate grades and credits? For many, it seems that this has become the case; now that their individual concerns have been addressed, many have contented themselves with the ample shield placed around their GPA’s and haven’t stopped to consider what this implies about the quality of our education. Let me explain. There are two general situations in which undergraduates have found themselves at the end of the strike – they are either resuming cancelled courses and will be evaluated on material for which there has been no formal instruction, or they have courses in which they will not be evaluated on certain material because of changes to the syllabi. In both cases, evaluations are no longer faithful to course content. Where the pedagogy has been lost, we have not had support or direction in our interaction with course materials, which implicates our comprehension of them. On the other hand, with modifications to syllabi, in many cases we are not being given the opportunity to demonstrate our comprehension of all course material. Consequently, the grades and/or credits that we receive at the end of term are precarious in the sense that they will not genuinely reflect the knowledge associated with their completion. This is why the academic continuity policy prompted an uproar about academic integrity. Though the resolution to grading policy has been swift, it has been far from simple. Many undergraduate students will now proceed into next term without full comprehension of foundational material for future courses, and even those who are graduating may leave the University without having fully mastered the more complex material. In short, the quality of education in these courses has tangibly suffered with these resolutions. Conclusively, I admit that the confusion of last week’s events – namely, the Dean of Arts & Science’s message regarding academic continuity on Monday, March 23rd, and the subsequent message from UofT’s President on Wednesday, March 25th proposing binding arbitration – spurred a sense of urgency to communicate my perspective and publish the following article, as they threatened even further confusion of the strike’s pertinent details. It seemed more important than ever to get everything out there, without much need for further refinement. Consequently, I believe I may not have tempered my own catharsis as much as was originally desirable. As such, I offer a version in amendment of the emotional fuel of the original, though in keeping with the abruptness of publication (which, through the golden lens of retrospect, is really a reflection of the abruptness of the strike’s conclusion). Have we been spared, or have we been sacrificed? 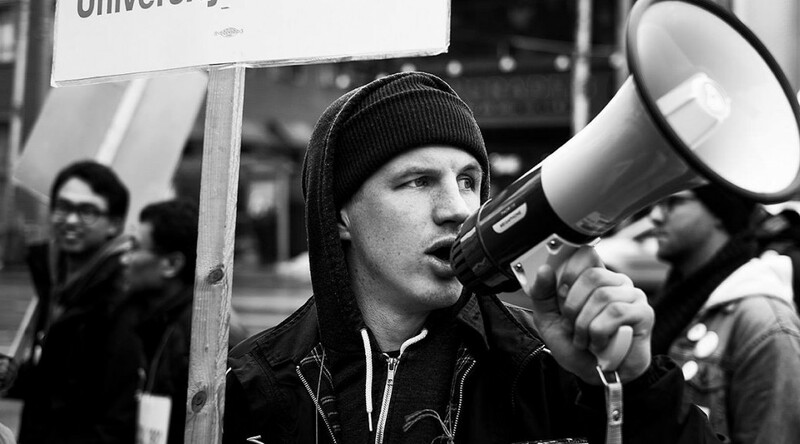 What will happen with CUPE 3902’s Collective Agreement? Will the long-term changes they have been seeking be addressed by its ratification? What is the probability of another strike in three years, when this year’s Collective Agreement expires? These are some of the questions that still occupy my mind. I leave you with them, in hopes that you do not leave your own questions unanswered. Change is difficult to accomplish, in any environment, and understanding the efforts of those who promote it requires as much introspection as it does engagement with the issues and individuals at hand. There can be no change without struggle, but there will be no change without our informed and active conduct. Let us remain interactive, and remain unified. 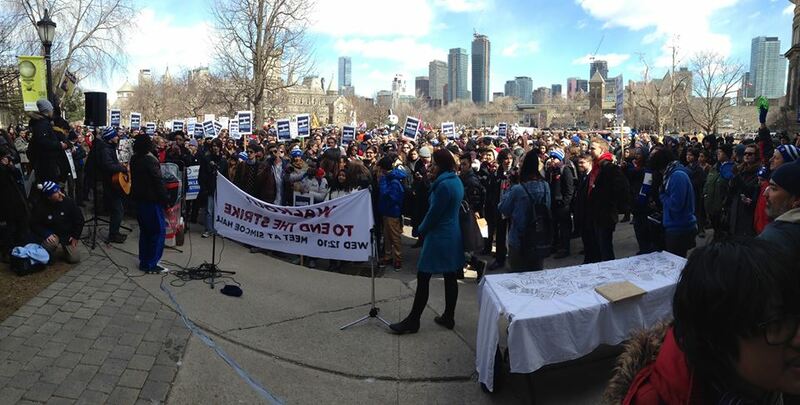 Before the publication of the final version of this article – which had already undergone last-minute revisions, as a result of the Dean’s surprise message to all undergraduate students regarding the completion of the academic term – the President of the University of Toronto, Meric S. Gertler, issued a statement announcing a “new approach” to ending the strike. Through the [Provincial] Mediator, he called upon Unit 1’s Bargaining Team to join the administration in a process of “binding arbitration,” through the intervention of an “independent, neutral third party, appointed by the Provincial Mediator.” Accepting this invitation would mean ending the strike, with both parties bound to accept the final terms dictated by the arbitrator. After having announced academic continuity just two days ago (which has sent some undergrads into an uproar), the strike may now come to an abrupt halt without many of its core issues being addressed. All of this is dependant upon the next CUPE vote. We hope that all students will benefit equally from the final outcome if the binded arbitration goes through. Until then, we will all have to hold our breaths again. “This strike is speaking out about important issues. It’s about using what little leverage I have to rectify what few injustices I can. It’s about showing everybody what it means to make a stand of solidarity and principle…In my hopes, this strike is not an end, but a beginning. After four and a half years at the University of Toronto, I can wholeheartedly affirm that the month of March is the most challenging of the academic year. As the month with the heaviest workload, it is the most stressful and – probably in conjunction with this – it seems to go by the fastest. For me, time has always become evasive in March. Every year, as the first few days of April creep up, I find myself scratching my head and wondering why February, in comparison, had felt like such an eternity… March of 2015 has been a paradoxical exception in this respect; at the same time as some days flitted by and blurred together for me, time also stood still at various moments in my experience of the CUPE strike. On February 27th, something that had been a mere a murmur in the hallway became an abrupt reality for many undergraduates, myself included. We had been informed weeks earlier that the possibility of a strike existed, as the Collective Agreement for unionized sessional lecturers and graduate student workers had expired and was pending renewal with the University Administration,. Few of us had realized that unsuccessful negotiations had been going on since July of 2014. It was the beginning of something that would profoundly and permanently affect my perspective of my undergraduate experience, the University of Toronto and, by extension, our education system as a whole. An increase of the minimum guaranteed funding package for graduate students at the University of Toronto, which is currently valued at $15,000. Tuition relief for senior graduate students. Reduction of class and tutorial sizes was also an original contention point, though this has been revoked from actual demands. There is also the issue of Health Care and Child Care benefits, which concern many of those on strike from an array of different backgrounds. The fact of the matter is, there are problematic details even in identifying these two “universal” points of contention, as there is so much variation between departments in terms of the requirements and stipulations of graduate programs. Let me clarify the ways in which departmental contracts may vary. First of all, at the University of Toronto there is a minimum guaranteed funding package of $15,000 per year. This funding package was secured by CUPE 3902 in 2000, after a 3.5-week strike. This was the first guaranteed funding package for graduate students in Canada. The Canadian Union of Public Employees, Local 3902, has existed since 1973 – it was the first union founded to represent the interests of graduate students as employees of the University in all of North America. 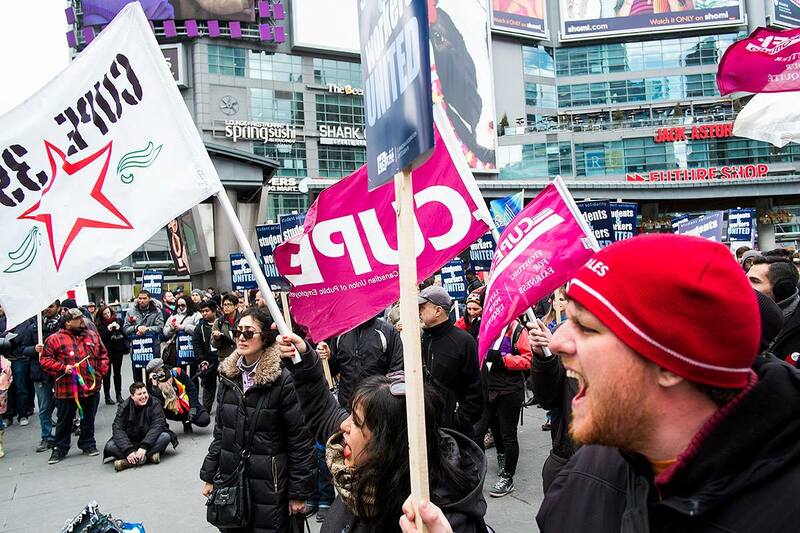 This year, members of CUPE find themselves in a situation similar to that of fifteen years ago. Considering that their Tentative Agreement is renewed every three years, it is difficult to believe that they will go on for another fifteen years without striking again – especially if an increased minimum funding package is not secured in negotiations with the Administration. Now, the operative word in characterizing this funding package is “minimum.” There are many departments whose graduate funding package is higher than the quoted $15,000 figure (as an example: the Department of Computer Science offers a minimum stipend of $19,300, as specified by Brian Law, whereas Civil Engineering offers a minimum of $23,550). Funding packages vary, as do details about them. Many Department websites simply refer those browsing to get in contact with the School of Graduate Studies for pertinent information. In our case, the Department of Spanish and Portuguese provides an explanation on policies for funding and TAships, citing CUPE’s Collective Agreement as the determining factor for TA compensation. They even go to the extent of providing links to relevant internal, external and travel-based scholarships. These discrepancies in the communication of facts and figures contribute largely to the myriad of confusion surrounding the funding package. On the topic of confusion surrounding the funding package, I also wish to interject here what I learned early-on in the strike about the hourly wage increase (to $43.97/hr) being cited by the Administration and what it implies for the minimum guaranteed package of $15,000. The answer is, essentially nothing. This hourly wage is just a statistic calculated from the proportion of the funding package that compensates graduate students for the TA and/or Instructor work they must complete as a component of their program. The proposed raise to $43.97/hr that was fed to the media by the Administration at the beginning of the strike is not reflective of a raise in the funding package, especially considering that the proposal also includes a cut in the maximum number of teaching hours (to 180). This has greatly contributed to the anger and frustration displayed by Union members, as the reality of their graduate funding is not being accurately represented. However, there are CUPE members who are also displeased with the Union for not representing the issue adequately, either. For example, we established in the teach-in of March 11th (mentioned above) that, should an increase in the minimum funding package be gained, the maximum number of hours allotted to graduate students for their TA work would be formally increased.. And graduate students are okay with this! They would prefer that their workload be formally increased, as this would better reflect the amount of work that many already perform in their capacities as TA’s and graduate Course Instructors. They want their compensation to be fair and want both the Administration and the Union to accurately represent it to the public. If you ask strikers for their opinion, you may be surprised at how many will tell you that both institutions are at fault for fighting dirty and playing the media game, which they do not endorse. There are additional differences in graduate student tuition and incidental fees among the departments. Many PhD students (and some in masters programs) do not pay their own tuition or incidental fees. Some departments even pay the Union fees for their unionized members. However, in the case where a student has either a scholarship, internal or external, many departments require that these fees be paid back, either in part or in full. This means that coverage of fees is conditional, at best. Thirdly – and most importantly – there is extreme heterogeneity in terms of departmental requirements for Teaching Assistant and Course Instructor responsibilities. For most graduate students, these are mandatory components of their programs, but many cases exist where the number of required hours as stipulated by their specific department is quite low in comparison to others. Some have no teaching requirements at all! These particular graduate students have the time to pursue extra TAships, Research Assistant and Course Instructor positions and are better able to support themselves. Those who must complete teaching hours for their PhD programs are at a disadvantage; if they find themselves short on capital, they end up having to cut into their research time in order to secure extra positions that will allow them to pay their bills and stay afloat. In addition, many graduate students are prevented from pursuing external work by the contracts they sign upon admission. The financial stability of some graduates is further undermined by simple impossibility of external income. Stepping away from the money issue, the availability of positions is different within each Department and varies depending upon both undergraduate and graduate enrolment, as well as the number of both tenured and contract Faculty teaching courses in a given year. Given that so many different factors can contribute to any individual graduate student’s situation at the University of Toronto, it is no wonder that CUPE 3902 has not managed to develop an “objective” or “universal” manner of representing the concerns and interests of its Unit 1 members. This is why reaching out to and dialoguing with the striking students is the best way to inform yourself about the realities of the strike. Go to the picket lines and ask them how they are holding up with all the stress and what their perspective of the strike is. Most graduate students involved in the strike support it, due to either their personal circumstances or simply in solidarity with their colleagues and friends; however, there are also many cases of disillusionment with, and even opposition to, the strike. Besides this, hearing authentic stories about graduate students’ conditions is eye-opening; so many students end up in precarious situations, in which some have to take out thousands of dollars in loans or have to forsake food in order to make rent in the downtown core. These struggles are much more urgent than the ethical conflict of those keeping you out of the classroom, though ethics and the role they play for many individuals also merit consideration. 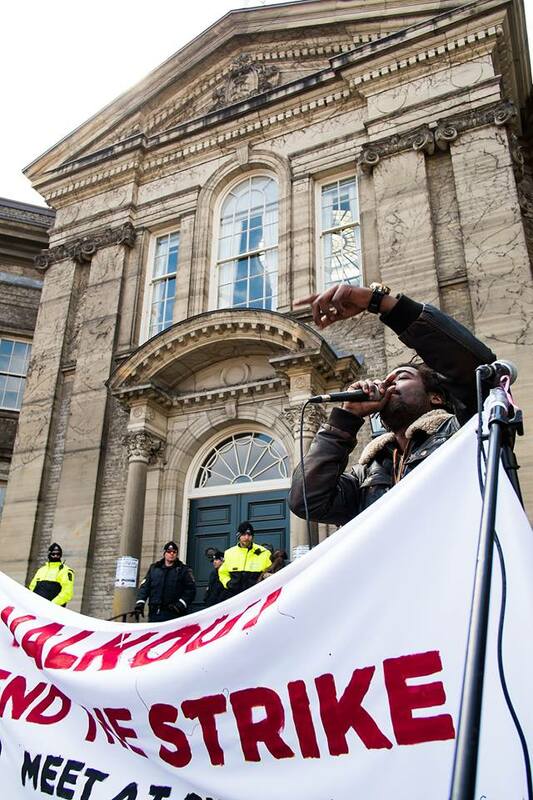 The University of Toronto is, in many ways, a microcosm of the diversity we frequently cite when describing this city. As logically follows, there is a myriad of perspectives out there, awaiting discovery. Those of international students are particularly enlightening, as many come from countries where universities, despite their much lower tuition fees, do not offer funding packages of any kind to graduate students. Apart from a frustration with the lack of preparation given to them regarding a foreign labour movement, one student expressed to me their surprise at the North American sense of entitlement that permeates this strike. Emphatically, each individual perspective is a unique one. 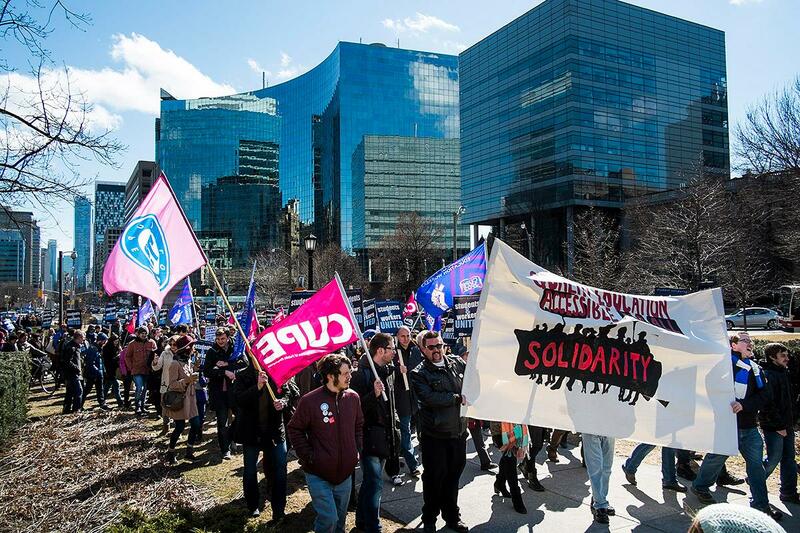 It is crucial that we recognize that the striking members of CUPE’s Unit 1, besides being our graduate students, are first and foremost human beings, each with their own set of circumstances and frustrations. As undergraduate students, we have a very different genre of frustrations with the strike. 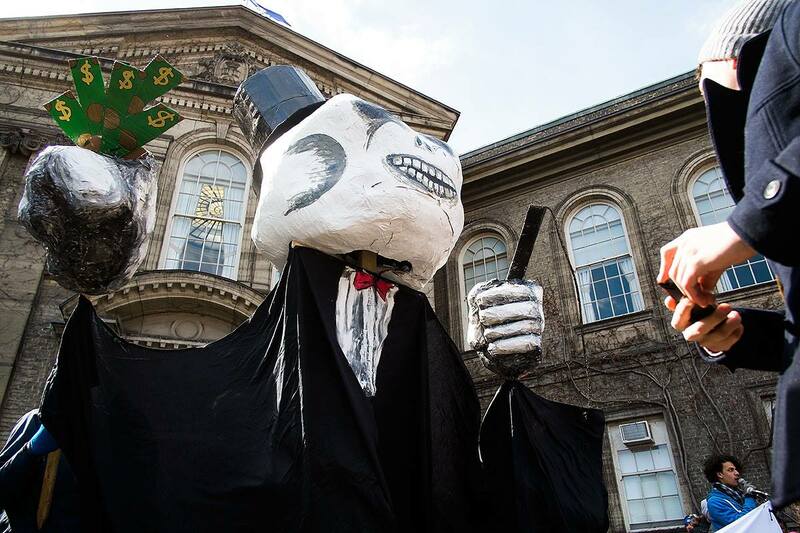 Though our accreditation is no longer in limbo, many students have been quite angry at the Administration, at the Union, or at both, for “wasting time” with the strike and essentially setting our tuition money on fire for the last few weeks. What’s more, with the Administration’s quick decision to extend the date for course withdrawal and the credit/no-credit option until after final grades are submitted, a vast majority of the work we have been encouraged to continue with over the course of the month have been set aside to collect dust – ethically, our professors cannot grade them! There are cases where 50-90% of term work has been lost and no one is sure how our final grades will be calculated, in any case. Most departments do not have a solution yet, and the Administration continues to direct us to them. For us – the “small fry” of the University community – the surprise resolution of our accreditation has simply generated more unanswered questions. Presently, I imagine the most pressing questions are being directed at Union members – why did they reject the Tentative Agreement that was reached last Wednesday, March 18th, and with such narrow majorities? Briefly, the rejection was spurred by the the Administration’s refusal to address the structural issues of its graduate programs. The structure of tuition fees for upper-year students is largely problematic, as they fundamentally do not reflect the expense of their activities on campus. In relation to the funding package, the Union is lobbying for clear language in the new Collective Agreement that provides a “per-member guarantee” of the sums that the Administration proposed in the Tentative Agreement. In short, they want to make sure every individual has a written guarantee of an increased minimum funding package (more info here). This would mean accurate representation of the funding of graduate programs in the Collective Agreement, as well as a stipulation on the behalf of the Administration on what portion of the fund increase each individual student is entitled to. While the media game continues, students engage in their own word-wars on social media outlets. After having keenly pursued responses from undergraduate students directed towards the Union, it is apparent to me that the solidarity we enjoyed with our graduate students last week has become abruptly short-lived. Is it really so hard to believe that striking graduate students are thinking ahead to the futures of potential graduate students? 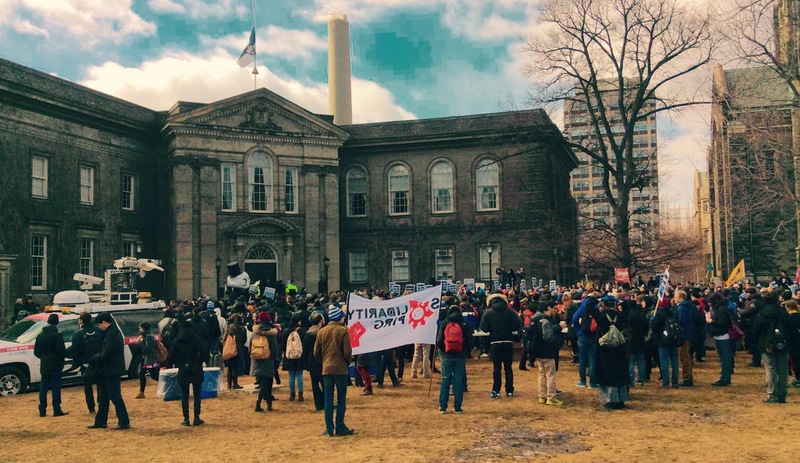 In rejecting the Tentative Agreement, they are addressing the long-term interests of graduate students at the University of Toronto, as they are upholding the importance of permanent structural change in funding, rather than just focusing on securing quick money for themselves. They have our backs on this one. And we should have theirs. I have very subjective reasons for this. Let me tell you a little bit about my undergraduate experience. The pursuit of my degree began in the fall term of 2010. 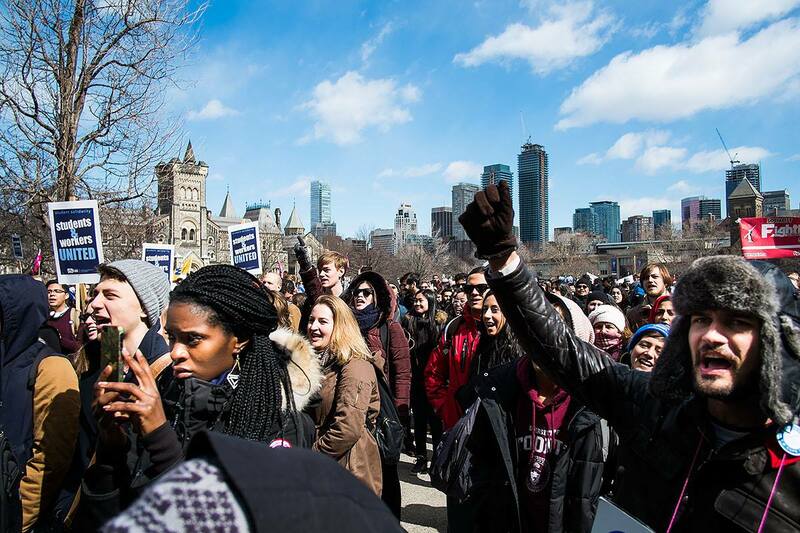 For the last four and a half years, I have harboured the sentiment that most undergraduate students are pretty alienated from each other – that there was nothing that unified all of us in any way, besides the fact that we all study at UofT. The strike, of all things, is what managed to change this for me in the last month of my studies. This strike has taught me many things in a relatively short amount of time. It has confirmed the corporate nature of our public education system, in which the majority of wealth is distributed into few hands. It has exemplified the difference between the selfish and the selfless, the greedy and the grateful. It has reinforced for me the value of an open mind, an empathetic heart and willingness for sincere conversation; it has also shown me that there are more people with these qualities than I had previously believed. More than anything, it has given me a newfound sentiment of solidarity with my fellow students, graduate and undergraduate alike. 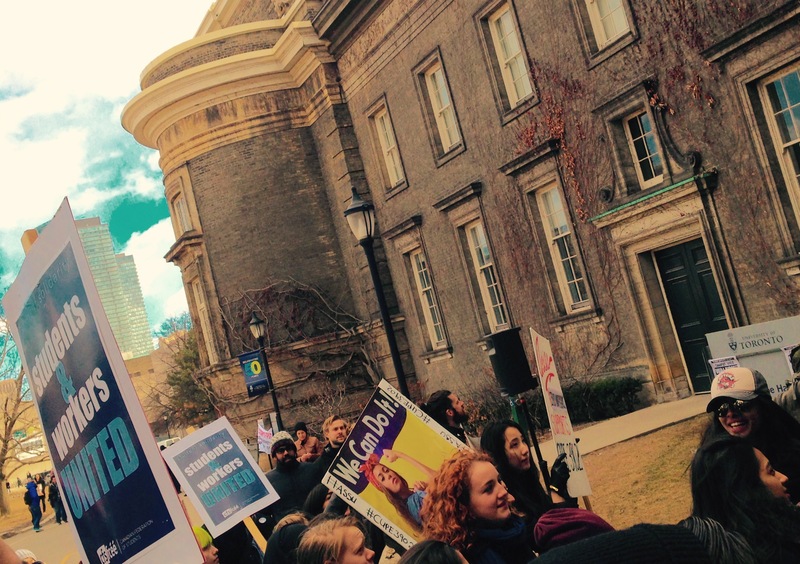 I experienced a strange sense of pride when I saw undergrads united outside Simcoe Hall at the Walkout, gathered in collective support of our striking graduate students’ cause. After nearly two hours of cheering, chanting and meaningful conversations, I left feeling, for the first time, as if I really belonged to UofT. It took me almost five years to feel aligned with the student body, and it is not a sentiment that I am so easily willing to forget about now that I have experienced it. For many people, however, solidarity is not enough reason to even consider this cause. This is why, in conclusion, I wish to reiterate a few things worth contemplating as the semester draws to a close. Firstly, I support the strike because graduate students have been an indispensable part of my education at the University of Toronto. Since September 2010, I have had 11 courses with tutorials at least once a week. I have also had 5 courses taught entirely by graduate students, and 3 full-year courses in which one semester was taught by a graduate student. In addition, I know of at least 4 other courses I have been enrolled in where there was an invisible graduate student marking all of our work. Quite literally, without the work of graduate students, my education simply would not have happened. I think it is extremely important that, before anything else, we undergraduate students take the time to reflect on who has been responsible for our education, and to what extent. Secondly, for those undergraduates who are taking up the “Me, Myself and I” attitude without taking the time to consider other people’s perspectives – if you are planning on applying to grad school, are awaiting responses to applications or have already accepted an offer of admission, you may want to do some research and inform yourselves as to what has been going on over the last few weeks. Anyone with the intention of pursuing graduate studies could potentially be affected by similar issues in the (not so distant) future, so this strike realistically represents their interests. Thirdly, I think most of us believe that we do not have the power to change anything – at least, this is what I have gathered after dialoguing with my fellow undergrads over the last few weeks. I can agree with this, in part; we definitely do not have the power to promote change if we stand divided, as we mostly have up until now. We have been divided and conquered as a student body, convinced of our apparent powerlessness because of our low position on the University totem pole and our lack of familiarity with the issues surrounding our education. This ignorance was partially forgivable up until the first week of March, as the Union is not permitted to have direct correspondence with undergraduate students. Since then, all of their communications have been made publicly available and their direct interaction with undergraduates, both on campus and online, is perfectly legal. Finally – look around. 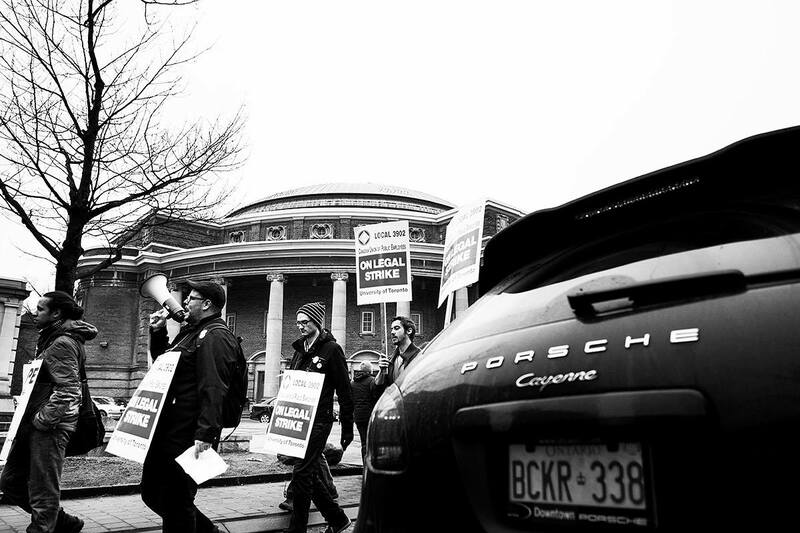 To date, CUPE 3902, Unit 1 has received: 30 letters of support from groups of faculty across all three campuses; 13 from groups of professors at other universities in Canada, as well as from Berkeley and the University of Glasgow; the support of 43 other labour groups; the support of 14 UofT Student Associations, 14 Student Associations from other universities and 7 community groups. Not to mention that countless conferences and other events have been cancelled because participants have been unwilling to cross picket lines. The point is not necessarily that the strike is receiving such a wide range of support – it is, rather, that so many people that are not directly affected by the strike have been willing to actively respond to it. Please, do the same, if you haven’t already. We owe it to ourselves, and to each other, to recognize that we do have a say in all this, especially because this strike is, in large part, about us – our money, our education, our future prospects…Get out there and ask questions, and don’t stop until you get the answers you are looking for. We need to stick together through all this – to inform ourselves and each other and, regardless of differences in opinion or sympathy to a cause, collectively determine what we can rectify to ourselves about the events that have occupied our realities for the last month. It is not about who is right or who is wrong. It is simply about what has been done correctly and in good faith; a matter of principle. As the dust settles, we will become better able to determine who has upheld the academic principles that provide for quality education. Jaclyn Bucar is a fifth year Spanish Major from the University of Toronto. She also studies French, Portuguese and Literature in English. In her spare time she enjoys reading, writing, listening to music and exchanging it with people.